At the annual meetings of the American Economic Association (AEA), held the first weekend of January in Denver, the association’s leadership established a committee to explore whether there is a need for rules in the profession to govern disclosure of apparent or real conflicts of interest. The issue arose in reaction to Charles Ferguson’s new documentary Inside Job, which exposes what appear to be stunning failures of leading academic economists to reveal the large incomes they received from business interests when writing reports and taking positions on policy matters of direct concern to those interests. The film, and a series of reports by journalists and economists that further documented failure to disclose, led the AEA leadership to break with a century-long habit of side-stepping ethical issues that arise in economic practice. It’s far too early to know what will come of this initiative, it just might mark the first step toward the emergence of a new field of inquiry in economics: the field of professional economic ethics. This development is long overdue. The economics profession exerts enormous influence over the life chances of others — not a few others, but all those who populate the economy. This influence necessarily implies that economic practice, from teaching and research to advising, forecasting, forensic work and the like, is ethically fraught. There is no adequate way to paper over this ethical fact, though the profession has done its best to do so. When a profession enjoys substantial influence over others but fails to examine and raise the awareness of its members and the public regarding the responsibilities that this influence entails, it is falling far short of its deepest professional responsibilities. It is a rogue profession. If Ferguson’s film ultimately has the effect of inducing the profession to mend its ways, he will have made a much greater contribution to economic welfare than have many recent Nobel Laureates. But there is a danger here as well. All of the recent attention has been focused on just one professional ethical issue: disclosure of conflicts of interest. Though hardly unimportant, this is a very narrow issue that is perhaps most easily addressed, as I’ve outlined here. The danger is that the AEA and other economic associations will fix this one problem, and believe themselves to be done with professional ethics altogether. But economists face much more important and difficult ethical challenges and professional responsibilities. In my research for The Economist’s Oath, I interviewed 40 applied and academic economists about the nature of their work, and the challenge they routinely face as they try to do their work with integrity. Turns out that these arise all the time. A simple example includes time and resource constraints: applied economists in particular are asked to do the impossible, generating reports in hours or days that would take weeks or months to complete properly. These reports sometimes are pivotal in shaping policy discussions and outcomes. They are asked to produce reports that appear to investigate a policy issue objectively, in order to assist in policy selection, when in fact the policy choice has already been made. They are sometimes required to alter their empirical findings, after the fact, so that they better accord with their institution’s mission; and sometimes they are given a target for their empirical work, in advance, and instructed to produce an analysis that hits that target. In the private sector this pressure can be more intense than in government agencies. Economic consultants face market pressures to provide “opinions” rather than “expertise,” as one economist put it to me, and some consultants succumb to this pressure. Consultants who resist and who produce honest reports may then find that the client distorts their findings by publicizing only those parts of the report that best sustain its objectives, while citing the consultant or consulting firm by name to establish the authority of its claims. Moreover, economists often are required to speak strategically rather than truthfully, and sometimes to lie outright, in order to pursue some important social objective. Most applied economists work in bureaucracies, which raises all sorts of other difficult issues. What is an economic adviser to do if she knows that by simply “doing her job,” working as a neutral technocrat who produces research as best she can and passes it on to the decision-maker, an incorrect decision will be made which will likely harm public welfare? What if instead she believes that she can prevail in the matter only if she exaggerates her confidence in what it is she recommends, withholds certain findings from those she advises, or leaks sensitive information to the press? In cases like this, what should a responsible economist do, when the lives of others are at stake? These are difficult questions, to be sure. At the moment, most economists who face them get no help whatsoever from their profession. Indeed, the only economic association in the U.S. today with any sort of code is the National Association of Forensic Economists. Moreover, unlike conflict of interest, most of these questions cannot be answered through resort to “moral geometry,” as one ethicist puts it. And that is a discomforting thought for a profession which delights in elegant, clean answers to daunting questions. There is no ethical corollary to Pareto Optimality: perhaps that’s why economics has done its best to steer clear of professional economic ethics. And so the new interest in professional ethics is far more likely to produce a limited statement on disclosure of conflicts of interest than it is to produce a new field of inquiry into the full range of messy professional ethical matters that arise in professional economic practice. Perhaps our best hope lies outside the profession. Perhaps Ferguson might be induced to jump back into the fray with another film that begins where Inside Job leaves off — probing the ethical conundrums, frailties and failures of an economics profession that has achieved tremendous influence over the past century without attending to the ethical complexities that its influence entails. George F. DeMartino is Professor of Economics at the Josef Korbel School of International Studies at the University of Denver. He writes widely on ethics and economics, as well as labor issues and political economy theory. 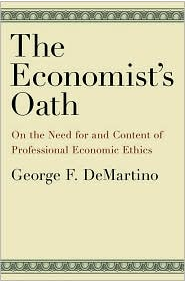 He is most recently the author of The Economist’s Oath: On the Need for and Content of Professional Economic Ethics.